The horse is not native to ancient Egyptians and the exact date of its introduction to the country is not certain. The horse is believed to have come to Egypt with the Hyksos around 1600BC, who settled in the Nile Delta from the Levant, looking for grazing land for their cattle. By 1700BC these new settlers had been in the area, marrying the native women, for long enough that they could take political control. The Hyksos founded their own fortified capital in the Delta, controlling Memphis and forging alliances with kingdom of Kush, while the Egyptian kings retained control of Thebes. The Hyksos proved very difficult to expel from Egypt due to their competence with the horse and chariot, a method of warfare that the Egyptians had previously barely come into contact with. But this was only so if they could fight on a level battlefield. The lightweight, high-speed chariots they utilized became very dangerous on all but the flattest terrain and a group of charging horses can rapidly become uncontrollable, potentially putting the passengers in a great deal of danger. 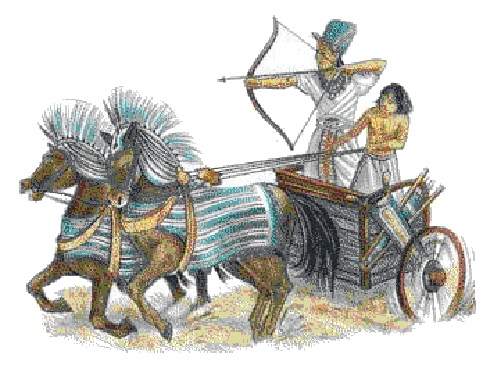 The chariots used by the Egyptians were lightweight, fast vehicles with two wheels, drawn by two horses. Within each chariot rode two men, the driver and the fighter. It is thought that initially the chariot was used as transport for the aristocracy and also for hunting. Since the turnover of chariot horses was likely to be very high, it is probable that a large stock of breeding horses were kept, to make sure there was a constant supply for battle. In the early years of the presence of the horse in Egypt, it is highly likely that horses were too precious to risk, so until stock increased horses were used very carefully. The horse soon became a much loved and prized possession for the Egyptian elite, particularly the Pharaoh. The horses first introduced to Egypt are smaller than those we are used to today, and had features similar to those of the Arab breed. Yoke measurements from chariots found in tombs give the horses an average height of 1.35m at the withers, or 13.2hh. However these animals could measure up to 1.50m, or 15hh. 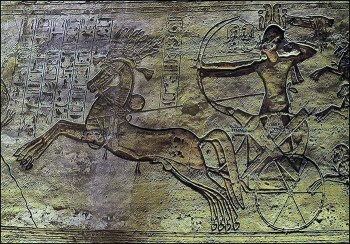 Ramses II mentions his horses in the Poem of Kadesh, acknowledging them for their part in the battle of Kadesh. This in itself might seem a strange thing; the Pharaoh rarely shared the credit for a victory with another human, so why should such praise fall upon horses? Relief showing Ramses II at the Battle of Kadesh. It appears that horses were also ridden. However, it is thought that a chariot would offer more dignity than riding, especially as those on-board were less likely to fall off. The representations show horsemen riding with a bridle and reins, and sometimes a cloth to sit on, but no saddle and stirrups. However, the horse was not used for draught work. It would be about two millennia before horses would replace oxen as work animals. This was partly due to the horse collar not having been invented, and the yoke collar was unsuitable due to the position it sat in. Also the Egyptians valued the speed of the horse too much to put it to work immediately. The horse came to Egypt at the pinnacle of the history of the country. Ancient Egypt had her largest empire and greatest power, and this was increased by the addition of the horse and chariot to Egyptian warfare. Although the horse arrived in Egypt too late to be included in the pantheon, it proved vital in other areas, especially with regards to wealth and status, and proved its worth for years to come. McDermott, B (2004) Warfare in Ancient Egypt. Sutton Publishing Ltd, Stroud. Partridge, R (1996) Transport in Ancient Egypt. The Rubicon Press, London.